So just days before David Jones releases its Winter fashion “Long White Winter” with Miranda Kerr, I’ve been spotting Myer’s “my designers AW2010” campaign everywhere with Jennifer Hawkins. As a lover of things black, studded, zippered or metalled in some way or other, I’ve really fallen for some of the pieces I’ve seen. 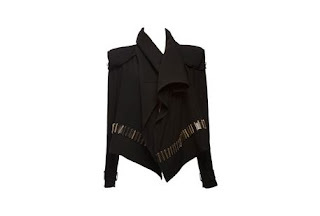 To the extent where I saw something I wanted yesterday in the latest Harpers Bazaar, and today went out and got it. The “to-die-for” item I had to have? Black studded Union Jack leggings from Cue. So punk! So goth! So chic! 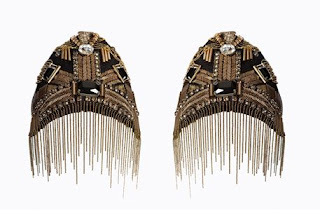 I did also really like the Camilla and Marc outfit from the Myer campaign, mostly because of the metal link embellished jacket (but $850 is a bit out of my range). If you want to see the entire designer pop up collection – here you go. I wore my other fave new black leggings with skeletons last night to see Echo & the Bunnymen. They are the Anatomist Negative leggings from Black Milk. 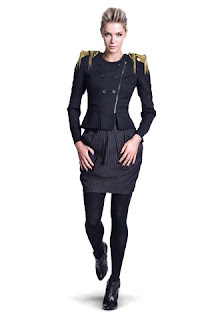 What do you think of the studded leggings and OTT epaulettes? Seen better? Links? 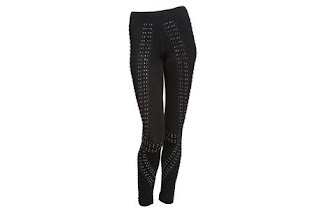 Oh, I knew that these were *ahem* "inspired" by other studded leggings, such as Topshop, and I was always going to get a pair of topshop studded ones, but the price and shipping and not being able to try on etc..put me off. I've now seen that there's a veritable plethora of studded leggings out there. As it was Winter in Europe they've been out all through Nov – Jan, whereas in Australia, we're only just now coming into Winter and getting these cool things. Yeah we always seem to get things earlier or later here and never at the same time as everyone else 🙂 You're right though, for a trend it's not really worth paying a bomb for if it may not last more than one winter.. saw a cheap version at supre today that I was tempted to pick up! i absolutely love those Cue leggings!!!!!!!! !